In a saucepan, heat the oil. Add the red curry paste, garlic, ginger and lemongrass and cook over moderate heat for 2 minutes, stirring. Add the mirin, coconut milk, soy sauce, fish sauce and basil leaves and simmer over low heat for 15 minutes. Strain the red curry sauce into a bowl. In a saucepan, bring the ale to a boil. Add the mussels, cover and cook over high heat, about 5 minutes. Using a slotted spoon, transfer the mussels to 4 bowls, discarding any that don't open. Add the red curry sauce to the ale and boil for 1 minute. 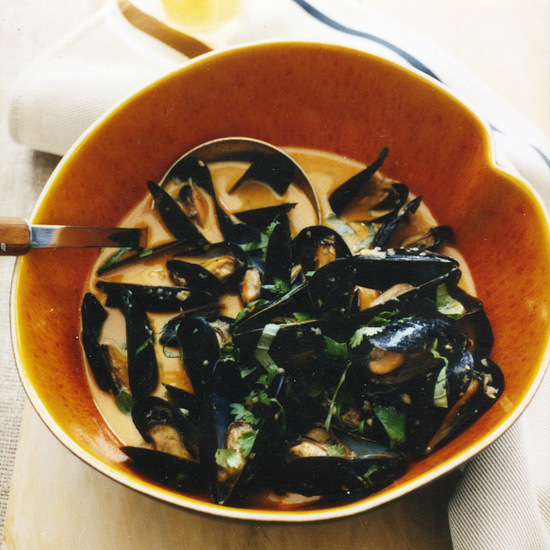 Pour the sauce over the mussels, sprinkle with the chopped basil and cilantro and serve. For pairing, Yoon favors a beer with more malty depth, like the Russian River Brewing Company's Damnation ale.